What is the process for going live on eBay? So you want to launch on eBay? Here are the steps to launch, or integrate, your Zentail catalog with eBay. For each step, click on the corresponding anchor link and follow the instructions. 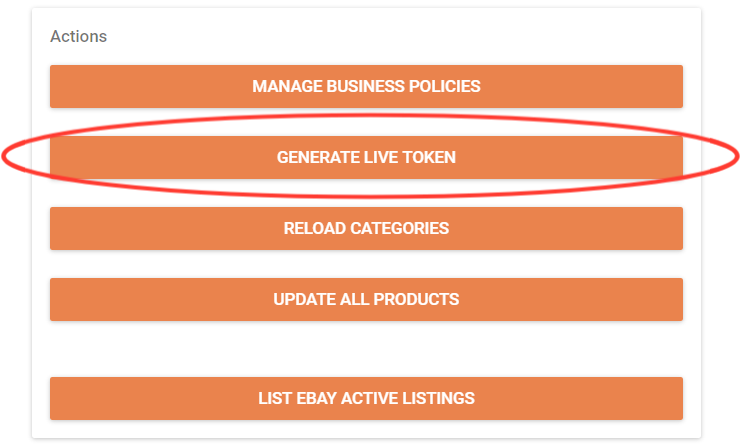 Scroll down and click the "Generate Live Token" button. Enter your eBay login credentials and approve the Zentail Commerce eBay application. Enter your PayPal email address in the “PayPal Email Address” field. 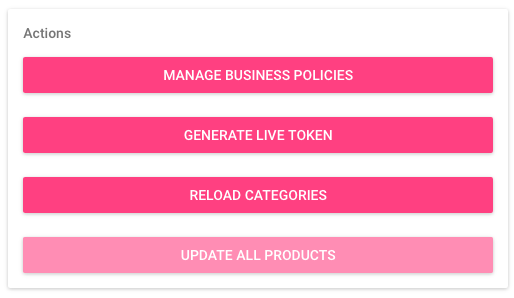 You can set up business policies on eBay, which will flow directly into Zentail. 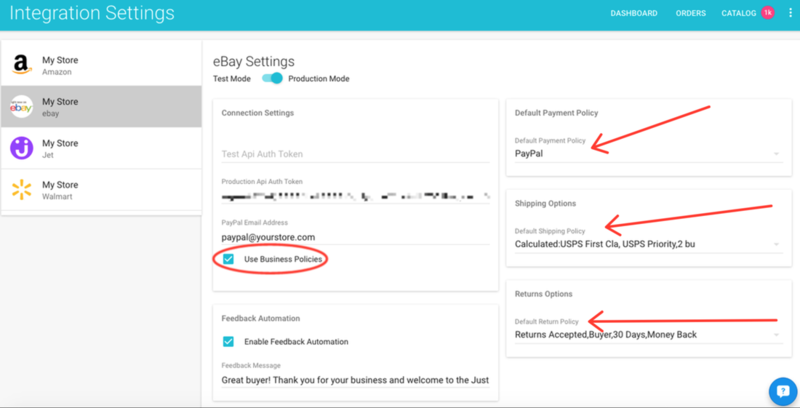 You can then set up default policies within Zentail, which will be used when creating or updating eBay listings from Zentail. In addition, you can select a specific policy to use on a per-SKU basis. If you do not have access to eBay Business Policies you may see the following error. Scroll down and click "MANAGE BUSINESS POLICIES"
Select the policy you want to use for each policy type. Newly created business policies in your eBay portal may take up to 1 hour to be retrievable in Zentail. Select a DEFAULT Payment, Shipping and Return Policy on the right hand side using the drop down menu. Note: If you don't see a policy in the drop down it means you have not activated the business policy. Scroll down to the "Actions" section => Click "UPDATE ALL PRODUCTS"
Scroll down the left sidebar to the "eBay" card => Click "ADVANCED OPTIONS"
Once eBay Business Policies are enabled, you will not be able to use your old account-wide and per-SKU eBay Shipping and Return Options that you had set in Zentail. To clarify, this means your old basic shipping options, payment and Returns settings won't work and will need to be replaced by a business policy as referenced above. If you did not use the Zentail shipping options you may disregard this. See this article from ebay for more on this. 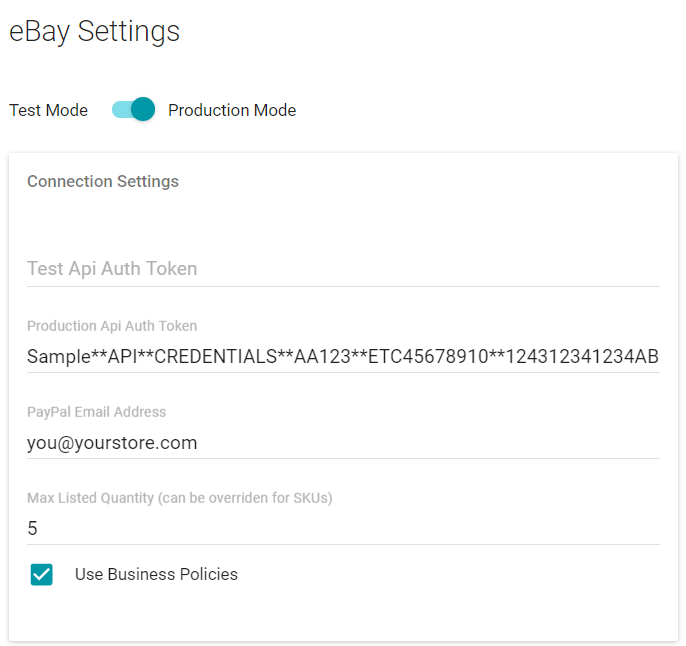 Enabling the eBay Product Data Sync on your Zentail integrations page gives Zentail permission to send your product data to eBay. Before you enable this feed option, make sure you're confident in your product data in Zentail. When does Zentail send product data to eBay? Confirm your product data is in good shape on Zentail- You have imported your best source of product data - You have resolved your eBay Critical Issues - You have imported your eBay business policies - Titles, description, images, bullet points, etc. are all in Zentail. Make sure you are view the eBay integration tab. Enabling the eBay Pricing Sync on your Zentail integrations page gives Zentail permission to send price to eBay. Before you enable this feed option, make sure you've reviewed the article on How to Audit Your Pricing in Zentail and you are confident about your pricing in Zentail. When does Zentail send price to eBay? Enabling the eBay Inventory Sync on your Zentail integrations page gives Zentail permission to send inventory data to eBay. Before you enable this feed option, make you are confident about the inventory in Zentail. When does Zentail send inventory to eBay? *This means, if you upload a new quantity into Zentail, or an order comes in from a non-eBay channel, then Zentail needs to notify eBay of the new quantity. If the quantity changes due to an order on eBay for that SKU, Zentail does not need to inform eBay of the new quantity. eBay has already deducted quantity to account for that order. Note: If you get errors from eBay related to the inventory feeds, check My eBay > Account > Site Preferences. In “Selling Preferences” you can open “Sell Your Item form and listings”, and choose “Yes, Use the option out of stock”. Enabling the eBay Orders Sync on your Zentail integrations page gives Zentail permission to send and receive your order data with eBay. 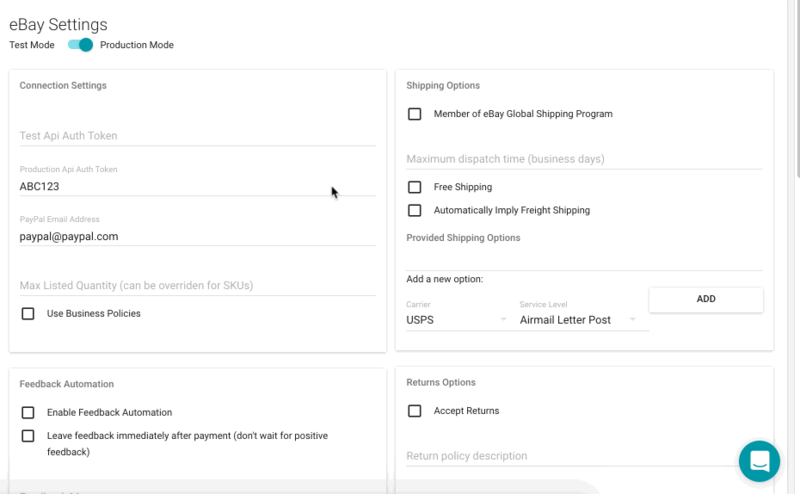 Before you enable this feed option, make sure you're confident about any automated fulfillment settings you have with Zentail. When does Zentail send order info to eBay? Make sure you understand any potential order fulfillment repercussions -- i.e. if Zentail is routing your eBay orders to ShipStation and another system is routing your eBay orders to ShipStation, you want to avoid double-fulfilling any orders. Make sure you are viewing the eBay integration tab.